Tired of those ill-fitting shirts and not willing to shell out a bomb to get bespoke trousers? We’ve got a solid list of tailors who will custom make your apparels just the way you like it. One of the first places we hit while looking for men’s bespoke clothing was of course the New Market area, the place that once catered to the Burrasahibs of the colonial world. Standing on Lindsay Street is Jaggi & Co, one of the oldest dressmakers for men that began its journey as far back as 1930s. And though the more popular Paris may have shut shop, Jaggi’s is still taking care of its legacy of loyal customers and tailoring clothes (shirts, trousers, suits and kurtas) just the way you want. While you’ve got to choose the fabrics from the store itself, you can get the attires ready within two weeks. Basic shirts start at INR 1,300 and trousers come around to INR 2,000. Sitting below the Dhakuria bridge, this one is easy to miss, but those who know of it keep coming back for more. From shirts, trousers, punjabis, kurtas, sherwanis and suits—Kohinoor does it all, but are best known for their perfect kurtas and panjabis. While the range for tailored kurtas and panjabis begin at INR 500, the kurta bottoms start at INR 250 and the sherwanis at INR 4,500. You can get your shirts and trousers tailored for INR 350 and INR 500 (excluding the fabric) respectively, and your suits for INR 4,500. Another popular men’s outfitters, they have been taking care of men’s fashion needs for more than fifty years now, Anita stands just beside Jugal’s on Rash Behari Avenue. Working mostly on cotton, terrycot, cord and denim material, the masterji at Anita's says he’s open to work on any material and on any given style. So, if you want a linen shirt or khakhi trousers made, just get the material and wait for a week to get it ready. While charges for shirts start at INR 300, trousers start at INR 400, panjabis at INR 300 and Jawahar coats at INR 2,000. Some of us have even got amazing women's capris and pants stitched here! We just gave capri pants from Fabindia and Anokhi as samples and they tailored them perfectly, down to the pin tucks and minute zips! If you love Fabindia’s handblock printed shirts, but find them a tad on the steep side then head to Padma Tailors on Rash Behari Avenue to get it tailored and fit to a T! The shop has been in business for more than 65 years and the masterji can work on a number of styles, He will also happily give you advice on styling,. They charge INR 250 for basic shirts and INR 350+ for trousers. These can go up depending on the design you want. Tucked inside BK Market, this shop is full of fabric rolls and tailored clothes. With their impeccable fit for formal shirts and trousers, Needlepoint stocks up on a variety of fabrics to choose from, besides being open to work on fabrics that you may provide them. While making charges for shirts starts at INR 450, trousers cost around INR 550. 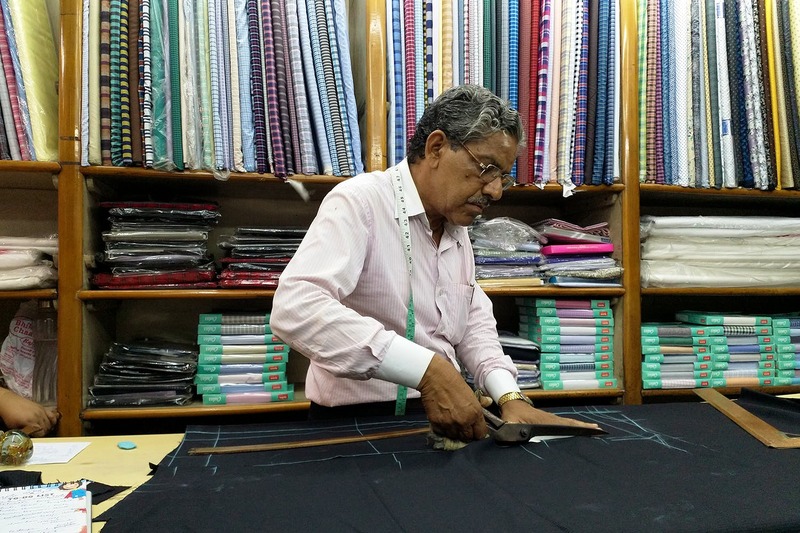 D Jas is a popular choice among men when they want to get their clothes custom made. They take less than a week to get your clothes ready for wear, and are open to accepting samples to produce a copy of the same. The making charges for shirts start at INR 210 and trousers at INR 280.